In the early 20th century, one of the most prominent families in Indianapolis would load up their carriage in the summer and travel an hour outside of the city to their country retreat. 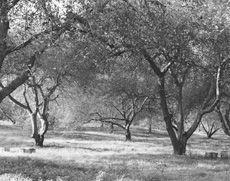 The Lilly children, Eli and Josiah Jr., would play hide-and-seek among the apple trees on warm summer days and the family would enjoy picnics in the shade of the apple orchard. 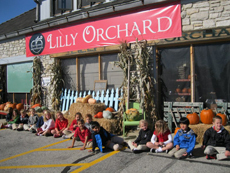 The Lilly Orchard store remains operating to this day on the same land, which was donated by the Lilly family to become home to Park Tudor School. Today, families come to Lilly Orchard to get a taste of the best apple cider in town, stock up on homemade caramel apples and get a brain freeze from the apple cider slushies. Our school’s history dates back to 1902 and it is full of great stories like this one. This year, we have been “rewriting history” on Park Tudor’s Facebook page. Every Wednesday afternoon, we share a little piece of our school’s history, always accompanied by a photo. Our fans’ response has been overwhelmingly positive. Here’s how to make a successful weekly post. Tell a story. Capture your reader’s attention and create interest in your institution. Every little story is a chapter in your institution’s book. Storytelling is a powerful way for people to get to know the real you. Ask a question. Often, we will post an old yearbook photo of a dearly beloved teacher and ask alumni for their favorite memories. The comments are always heartwarming or hilarious, with an added bonus—prospective families can read the comments and know that we have a rich tradition of exceptional educators. Appeal to a large audience. While the historical facts are mostly meant for alumni who will remember “back in the day,” the stories are interesting to any reader—including current students and parents, prospective students and parents, faculty, neighbors and grandparents. Our fans can relive memories or learn something new. Post consistently. By now, many of our fans know that we will make a historical post each Wednesday afternoon and they expect to see one in their news feed. This keeps our audience engaged, and it frees up some time because we know exactly what kind of content to post on Wednesday. A teamwork approach has been another success factor for Park Tudor. For the most part, I’m a one-person social media shop for our institution. This year, someone in on our alumni and development staff approached me and asked if she could help. Of course, I said yes! Each week, she is responsible for finding a fun piece of school history and sharing it on Facebook. It takes a load off my shoulders and is a tremendous step in telling our institution’s story through social media. If you’re looking for a way to be more consistent with your social media posts and tell some great stories, try a weekly historical fact. Or leave a comment and let me know other ways you’re engaging with your audiences with a weekly or daily feature. We do a flashback every Friday on our Alumnae Page and showcase a handful of photos from our archives. We get a great response from our alumnae who love seeing themselves back in the day. We always try to include at least one photo of our boarders as we phased out boarding in 2008 after a 90-year history. And, we show at least one class graduation photo each time. It’s a fun use of our archived photos and engages our alumnae base (and gains new fans for the page with each posting). I love the idea of engaging our School page in historical facts. Andy, Sounds like you have a great plan going! This weekly feature is really the only one we plan for every week, but I can’t tell you how much of an impact it has had on our social media strategy. Just knowing that we will have something posted on Wednesday, and knowing what kind of post it will be, helps with our time management. I’d love to have a more planned-out “week in social media” structure like you have. It’s simple and effective. Thanks for reading and leaving such a great comment! Great idea with a weekly historical post, and some good tips for recurring weekly posts on Facebook! We’ve been doing something similar recently, where we have a simple digital content plan, which is decided upon at the beginning of each week, but has reoccurring weekly features for each day. For example, featured events on a Monday, video Wednesday, University news on Tue & Thurs, and feel good Fridays, plus any other relevant content that falls outside of these categories. It’s nothing spectacular, but it just helps us to plan the coming content for the week on our various digital communication channels. It’s really helped our overall communication strategy, and has given us a better structure, which has helped to minimise the amount of ad hoc communication we had in the past. Thanks for sharing, it’s always good to get some outside inspiration from the same field, but outside of our own institution!